As well as viewing your readings via your seneye.me dashbaord you can also download our mobile app for a simpler way of keeping an eye on your fish. You can now activate your slide via your phone and avoid having to type in the slide code by scanning it instead! On Android and Windows 10 you need to go to the drop-down menu in the right-hand corner of the app. On iOS click the slide icon at the top right. Simply place your slide packet in front of your phone camera and it will scan the QR code and activate the slide. 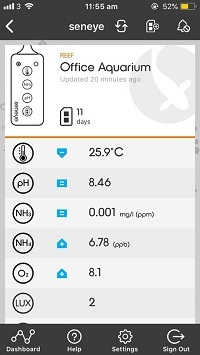 The Maintenance feature has now been added to the Seneye V2 mobile app and functions the same as on your seneye.me dashboard. So enabling Maintenance for a device will prevent all email and SMS alerts, such as out-of-water alerts and high/low parameter alerts, for 3 hours or until you turn Maintenance off. This feature is ideal for water changes, changing slides, and general aquarium maintenance. 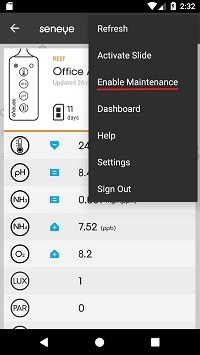 Simply go to your app, click on the bell image for iOS users and for Android and Windows 10 users tap the 3 little dots in the top right corner of the app and select 'Enable Maintenance'. There is a direct link from your app to your dashboard. 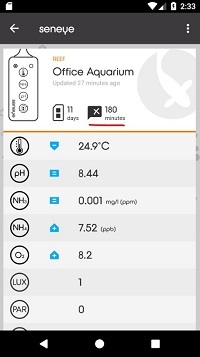 Your app gives you the lowdown on what's going on live in your tank/pond but if you want to analyse the data collected by your seneye your seneye.me dashboard is where all this data is stored and plotted onto graphs. For IOS you need to click on the dashboard icon at the bottom of the app page and for android those three little dots in the top right-hand corner of your app will provide you with a drop-down menu.